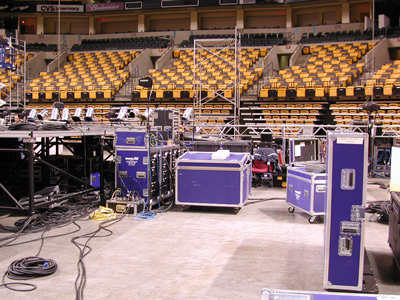 Staging equipment for the annual meeting of the American Veterinary Medical Association (AVMA) at the Fleet Center in Boston. Electronic graphics were an important component of the annual meeting produced by Williams/Gerard Productions. Computer graphics operator: Christopher Mardorf. Staging and set-up for the annual meeting of the American Veterinary Medical Association (AVMA) at the Fleet Center in Boston. Electronic graphics were an important component of the annual meeting produced by Williams/Gerard Productions. Computer graphics operator: Christopher Mardorf. Kick-off of the annual meeting of the American Veterinary Medical Association (AVMA) at the Fleet Center in Boston. Electronic graphics were an important component of the annual meeting produced by Williams/Gerard Productions. Computer graphics operator: Christopher Mardorf. Kick-off of the annual meeting of the Health Insurance Association of America (HIAA) at the Hyatt Hotel in New Orleans. Electronic graphics were an important component of the annual meeting produced by Williams/Gerard Productions. Computer graphics operator: Christopher Mardorf. Lighting truss at the annual meeting the Insurance Accounting & Systems Association (IASA) at the Henry B. Gonzalez Convention Center in San Antonio. Electronic graphics were a component of the meeting produced by Annie Groeber. Computer graphics operator: Christopher Mardorf. Setup at the annual meeting the Insurance Accounting & Systems Association (IASA) at the Henry B. Gonzalez Convention Center in San Antonio. Electronic graphics were a component of the meeting produced by Annie Groeber. Computer graphics operator: Christopher Mardorf. Back stage in "video village" at the annual meeting of ACE Hardware at the Orange County Convention Center in Orlando Florida. Electronic graphics were a component of the meeting produced by Williams/Gerard Productions. Computer graphics operator: Christopher Mardorf. Stage and delay screens at the annual Tupperware Convention at the Pennsylvania Convention Center in Philadelphia. Electronic graphics were an important component of the annual meeting produced by Williams/Gerard Productions. Computer graphics operator: Christopher Mardorf. Stage at the quadrennial meeting of the YMCA General Assembly at the Ernest N. Morial Convention Center in New Orleans. Electronic graphics were an important component of the meeting produced by Williams/Gerard Productions. Computer graphics operator: Christopher Mardorf. Electronic graphics are an important component of the graphic design and theatrical staging of corporate events. The photos on this page are production stills from many live events that used electronic graphics and video to convey an organization's mission and message.